Every couple of weeks the official SimCity Facebook page puts on a screen shot challenge to "Build the Best City", where each event has a different theme. Since I've started trying to win these, I compiled a list of links to see what the previous contests were. For extra credit you can try to identify all of the SimNation Guild members in each gallery. There's usually at least 2 or 3 members in each contest. If you'd like to get in on the action, read my Guide to Making a Winning Screenshot. I recommend taking part. It's fun to build a city with a particular purpose in mind and see what kind of creative spin you can put on a screenshot. This screenshot of mine won the #SimCityBTB contest for "Best Circle City"
Although I can't help you make an interesting looking city, I can give you a few pointers on how to make a good looking screenshot using the game settings. The first rule of making a cool screenshot is to turn off all the visual clutter from the game. Uncheck "Always Display City Boundary"
Unless you like having a large white square on the ground in your photo, go ahead and turn the boundary off by unchecking this box. Check "Hide UI in Captured Videos and Screenshots"
This will turn off the user interface i.e. all the toolbars, the clock, the amount of money in your bank. This option allows you to see things from a higher perspective. It's great for taking plan view photos of your site. Don't let the world know how bad your video card is. Since you want to get the best quality photo possible, turn up your graphics settings to the maximum. You won't care how smooth the gameplay is as long as you get the shot. Don't forget about the Tilt Shift efffect! Play around with the Tilt Shift setting to see what you prefer. You can get some cool views by turning it up. I practically forgot it was there since I normally turn it down when playing the game. I find that the tilt-shift effect works best when viewing down at an angle. By slightly changing your focal point, the buildings on the edges will blur. It can give your image a nice three dimensional feel to it. Using tilt-shift during night shots can give a nice glow to the city lights as well. If you'd like a crisper look to your photos, uncheck anti-aliasing. Leaving it checked will soften the edges of the buildings. Use an image filter to make your shot more interesting. There's 21different image filters to choose from. I compiled a full set of examples for both day and night. You can view them in the gallery below. To get a better look, click on the photo and view the full size versions in the Picasa web album. Shhhh.... Dont' tell anyone I told you this: When taking a screen capture with the UI on, make sure that you're showing a profit by temporarily raising taxes. If you don't, you WILL have a Bigger Map troll say something about your city not making any money even though you're making millions off of electronics or whatever else you have. The display of the sun and moon changes at the top of every hour. Knowing the timing of the rising and setting of the sun and moon can give you opportunities to make interesting looking screenshots and videos by including them in your photo. 5:00-6:00am The Sunrise hour. Although the sun is not above the horizon, you can get a nice golden hue off off the sunlight..
6:00am The sun rises above the horizon and yet is low enough to be included in screenshots of the skyline. 7:00am The sun rises too high to be seen. 6:00-9:00pm Sunset: As the sun sets during this three hour window you can get some interesting views of your city as it prepares for night time. 9:00pm The lights turn on, but sunlight is still visible. 12:00 Midnight The moon rises. 3:00-4:00am The moon is at it's lowest point in the sky. Golden Hues: Sunrise 5:00-6:00am, Sunset 6:00-9:00pm. If you're using the Film Noir, Black and Red, or other filter with a lot of black, don't forget about the Brightness Setting. You can turn it down for a darker look. Some of the filters make things too dark, and you can lighten them up with the brightness setting as well. Don't be afraid to take lots of pictures. To make a screen capture, just hit "C" on your keyboard. On windows 7, they get saved in Documents/SimCity/Pictures. It's nice to have a record of what things looked like over time. You can use them to enter the SimCity Bulid the Best Contests, share with your friends, or even use as a desktop wallpaper. You never know when one will come in handy. I got the most likes on a screenshot that was in the "Community Bridge/Tunnel Gallery 2" but it was one that I just happened to take while I was playing the game. Try out lots of options. 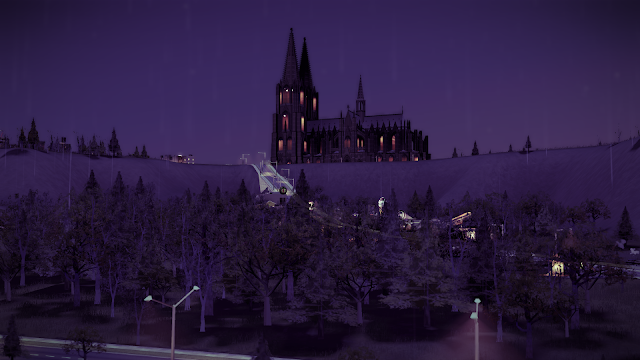 My winning "Spooky" shot of the cathedral on a hill was one I had tried multiple things on. In the end, it was my first shot that I ended up choosing. The cathedral was turned off because I didn't have money to run it. Unbeknownst to me there were orange tinted lights internal to the cathedral which turn on when the cathedral is turned off. The photos with the cathedral turned on and the entire city built out did not look nearly as spooky as the original. You can see my various attempts from roughly the same angle in the gallery below. 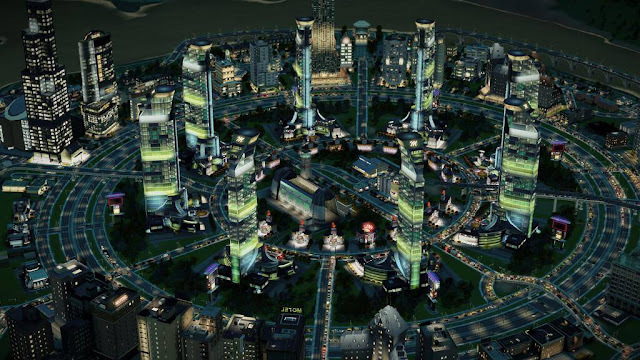 Although they say that you can email your photos to SimCityCommunity@ea.com, I would advise against it. Members of the SimNationGuild have had much greater success by tweeting them to @SimCity with the hastag of #SimCityBTB. Don't have a twitter account? Get one. They're free. UPDATE: My new advice is to submit both ways, tweet them AND email them. I haven't gotten a retweet the last two contests, and my submission via twitter was originally ignored. After posting my photo in the comments in a contest, they added it, and I went on to win. When sending photos via twitter, you'll need to make sure it is less than 3MB. If it's too large, use a photo editing program to save it to a jpg which will decrease the size. I recommend Gimp which you can download for free here. Get your entry submitted by the end of the day on thursday after they announce the theme. Better yet, make sure you make it in time by submitting it on wednesday. Your chances of getting noticed, and a retweet are better when sending your tweet during the day. I originally submitted my winning screenshot at about 2am on a thursday. I didn't get a retweet on it by @SimCity so I sent another tweet at noon on friday and it was retweeted within seconds. To have a great shot at winning, join the SimNation Guild on Facebook. Our members tend to vote for each other. For bonus points, send your tweet with the #SimNationGuild hashtag as well. The winner is announced a full week after the selections have been posted. Usually on saturday. UPDATE: The winner of the Academy City contest was announced several days after the finalists were selected. It was not a full week. If you'd like to check out all of the previous #SimCityBTB contests, I've compiled a list of links here. This screenshot of mine won the #SimCityBTB contest for "Spooky City"
I made it into this week's Build The Best Contest! This week's theme is "Best Academy City". Please do me a favor and go Like my photo on the main SimCity Facebook Page by clicking on the link below. Here's a link to the contest gallery. Maxis' main social media guy Michael Donahoe @cootweetbro left Maxis and is now working for Facebook. The #SimCityBTB contests has been a bit disorganized since he left. Although I tweeted the above photo in plenty of time, I never got a retweet. They originally only had 3 entries to the contest. I posted my photo as a comment in the gallery, and then they included it after the fact. This tells me that the new social media person doesn't follow twitter very closely and/or doesn't search for the #SimCityBTB hashtag. I now recommend that you submit your photos via twitter AND email to SimCityCommunity@ea.com. I think all of the initial entries were via email. 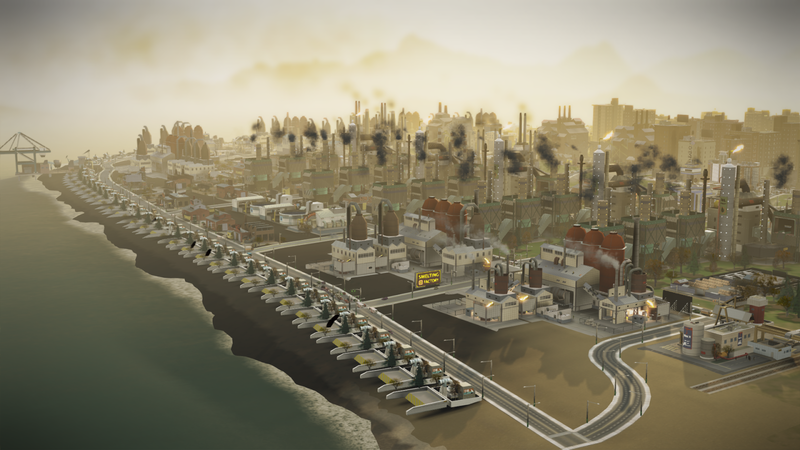 The mission: Create a disgusting, pollution filled city. My solution: I used a map with a super long coastline, Soiree Sands in Reflection Atoll. Now, Soiree Sands has no resources, and would generally be used for a nice high wealth city or suburb. 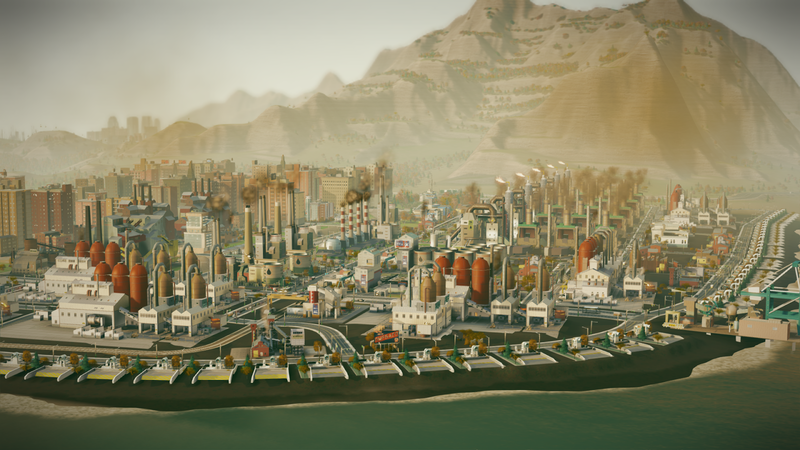 I had previously unlocked the Smelting Factories, Refineries and Trade Depots when building an arcology, so I decided to turn Soiree Sands into my own version of an industrial port, like Long Beach or Oakland. 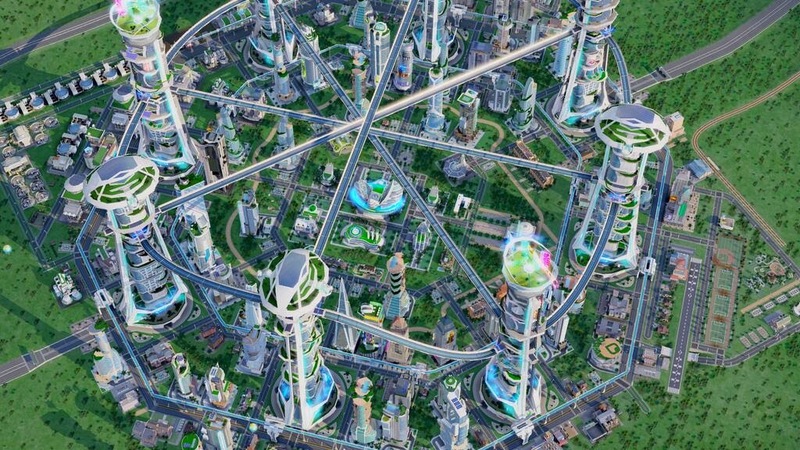 To create the city, I gifted myself $3 Million from my Circular Casino City which is two cities away. I built High Density Residential and Commercial on one half of the map and filled the other half with eight Smelting Factories and five Refineries. 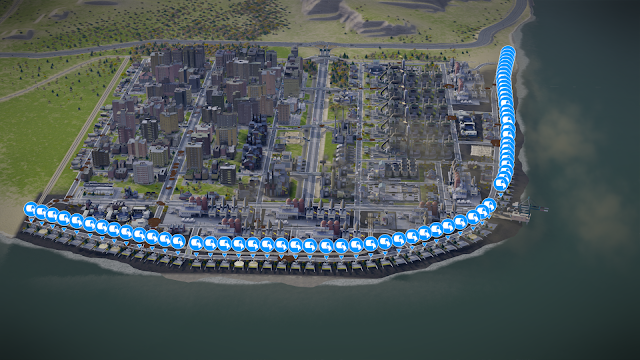 I have three trade ports: Two with trains, one with boats. The fun part was that I laid out a road along the coastline and lined it with sewage outflow pipes. I haven't counted them up yet, but there must be about 30 or 40 of them. 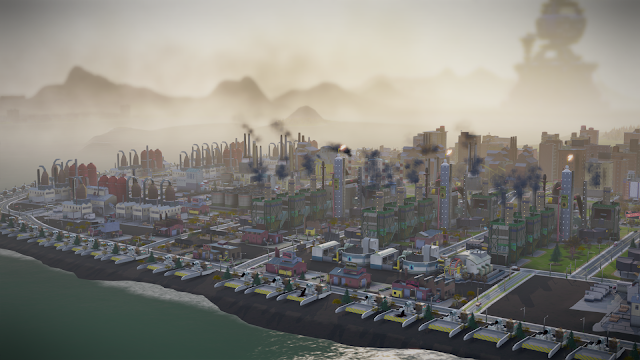 Since I’m a civil engineer in real life, this goes against everything I was taught on how to design a sewer system, but the mission was to create the most disgusting, pollution filled city….so I went with it. Can you count the number of sewage outflow pipes? Since this map only has one entrance, I created a central avenue that was slightly lowered to act as a main highway to provide access to the trade ports at the end. I snuck the train along the sewer outflow pipes and into the middle to provide rail access to my port. You can see it in the lower right of the photo above. 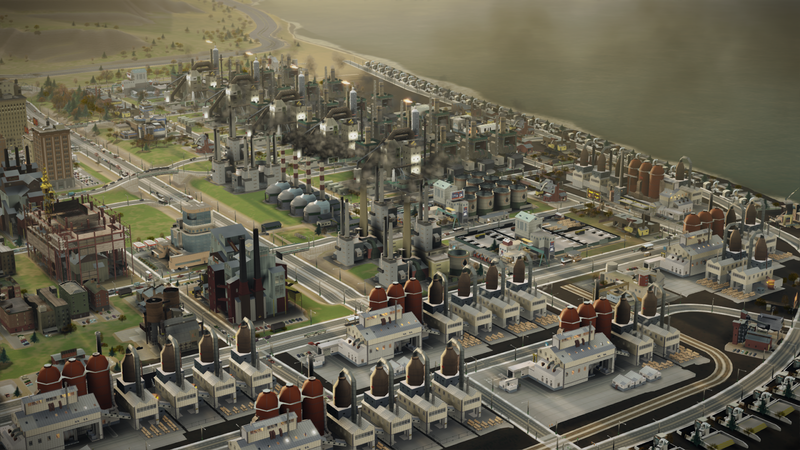 This has a nice shot of the five refineries all lined up in a row as well as the huge amount of sewage outflow pipes. I tried to provide a lot of street cut-throughs to get the sewage outflows used as equally as possible. I'm pretty happy with how it worked out, and frankly it functions really well. Of course it has a negative cash flow on an hourly basis, but it's all made back and then some in the sale of all the resulting alloy and plastic for a nice monthly profit. It was a fun little project that took me two nights to complete. I have a few more photos over on my SimCityPlanningGuide facebook page as well. Want to participate in the #SimCityBTB contests, but don't know where to start? Read my "Guide to Making a Winning Screenshot". Another win in the #SimCityBTB Contest! I just won the #SimCityBTB Contest for Spooky City! That makes two in a row that I've won. WOOT! 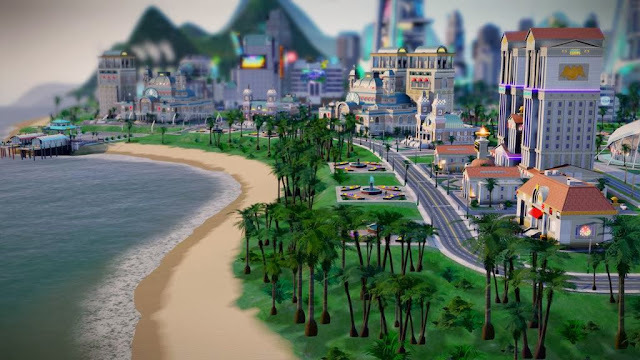 Just uploaded a Quick Tour video of my circular casino city which won the #SimCityBTB contest. You can watch it below.